There are lots of reasons for visiting Willington Woods, be it walking the dog or wearing out the children (or parents, depending on your point of view). You might be engaging in some sort of running or cycling activity on the paved pathways. Anglers, canoeists and boat operators enjoy the river, and other folk visit the woods for the flora and fauna and to bask in the peace and quiet (A421 permitting!). The woods are maintained by a small team of volunteers and the occasional contractor. It’s a perpetual project of continuous improvement for the benefit of the ecology and the visitors alike. The volunteers are managed and directed by staff at the Marston Vale Forest Centre. Occasionally, the volunteers perform tasks which take them away from their usual core activities; recently, the team was tasked with clearing a section of river bank and installing a new bench nearby (the woods are a great place to spend an afternoon but it is always nice to have a spot where you can take the weight off your feet, have a break and enjoy a view of the river). Much of the bank was cleared by a team from the Ordnance Survey, who had a community engagement day in the woods (more about this exceptionally successful event another time). 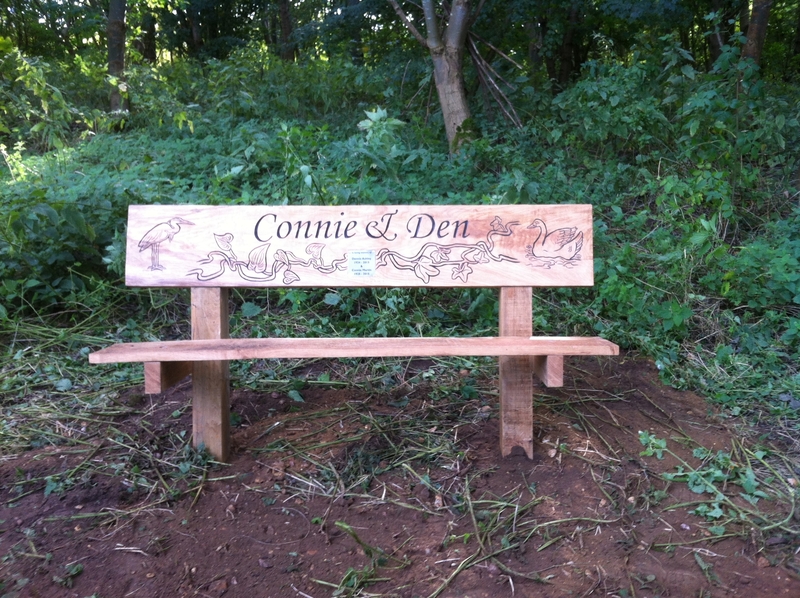 The recently installed bench is special: it is in memory of Connie and Dennis Ashley who were regular visitors to the woods, and I’m told that they particularly enjoyed the stretch between Danish Camp and the Elstow Brook confluence. 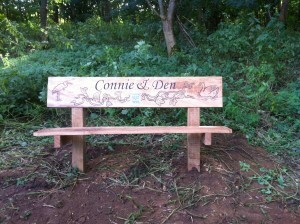 Sadly, Both Connie and Den have both since passed away but Connie’s cousin, David Wood, commissioned the bench and asked if it could be positioned near the river. The bench is beautifully made and is a tribute to a couple who made their mark in the community and, like many others, did great things for their country.